With Halloween just around the corner, and the holidays quickly approaching, the most pressing thing on the Man Of The Hour agenda is… who Katy Perry’s seeing. The third episode of Man of the Hour’s 21st season is a lucky one, thanks to Seb’s four leaf clover (that basically only works for guitar picks). 2102: Where Did This Accent Come From? This week, Seb & Pat take on Smallpools and big pools, satisfying careers, and everyone’s celeb crushes David Beckham and Justin Timberlake. 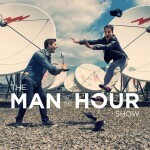 The guys are back for the twenty first season of Man Of The Hour, and now that the show is legal, they have a lot to talk about.